Showing results for tags '1:64'. Hello all Now is the time to start my second build log since I have finished the Americas Cup Endeavour. I am more interested in warships of the age of sails so it feels natural to build Sherbourne as a second kit. The ship is not so big but still has all features of a period ship. The main purpose of this build is to learn as many skills as possible so I can not tell how the finished model will look like. I will scratch and replace many parts in the kit just to learn how to do it. The model will be of darker but better walnut than supplied in the kit. I bought it in a local hobby shop here in Helsingborg and I think it is Amati's replacement wood. As sources for the build I will use AOTS Alert, Rigging period for and after craft and other books that I find fits. I will also pick ideas from Chucks cutter Cheerful and of course from the very nice Sherbournes by Gregor, Dirk, Tony and Kester. I hope you don't mind I follow some of your ideas . Ps, Some of the pictures are to small. You will see the full photos if you click (open) on them. Greetings Friends; It has been over a year since I have posted on this forum. For any who are interested in the travels of fellow captains I share briefly......Following my completion of my USS Constellation Model of which I was quite proud, I was looking forward to my next project. This was delayed by the birth of my first child; a daughter Clara. Apparently it is much easier to sneak away to the Shipyard when the Admiral is sleeping off her third Trimester than it is during the first 4 months of newborn-hood. So suffice to say, sharp objects and bits of wood flying about were not in the plan for me. Then, in mid-summer I suffered a serious accident. I don't care to get into the details but long story short I lost the use of my right eye. It was traumatic for me and there was quite a recovery before I was able to resume my regular routine. I found adjusting to the loss of biopic vision to be quite difficult and still find depth perception to pay tricks on me at close range. By the fall I had recovered enough that I began testing my hand at some of the many activities I enjoy so dearly which require the use of my sight. I began painting miniatures again and found it quite difficult, but not impossible to manage a brush on a 28mm figure once again. I practiced a lot and am almost, but perceptively not quite, back to where I was. Then a few weeks ago this kit fell into my lap. A friend of a friend found it in a garage sort of thing and to my surprise it was 100% in tact with even the receipt (2002?) in the box. My questions as to if I could still manage model ship building with only one eye is about to be answered. All without spending any money up front on the experiment. So without further ado......my build log for Mamoli's Blue Shadow US Brig. So this will be my 3rd build and my first model shipways kit. Up front I am impressed with the supplied kit. After inventory the any issue was some broken or bent cannons. I have read extensively about model shipways customer service so we will see how that works out. Oh yea and just to let everyone know up front I am an absolute F.U.N.G. So most of the proper terms for the parts of the ship are beyond me, but I am learning. Makes me wish I had payed a little more attention about navel history during boot camp. So here we go ! 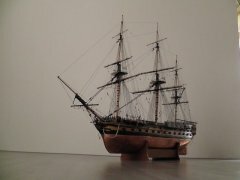 I am new to the Model Shipways community, and I suspect I am one of your younger members (born 1988 - anyone younger?). I grew up on an island in Maine and was always around boats, and my whole life I have been doing something boat-related in one way or another. The neighborhood kids had tree houses; I had a rowboat in the yard that my dad had turned into a kid-sized lobster boat. When I was growing up I made many simple boats from kits (the kind with a solid hull and like ten simple blocks that you glued on for detail). I had a Titanic phase some time before middle school: plastic models, paper models, and high-pitched lectures about waterproof compartments and buckling steel to anyone who would listen. In the last few years, I made two small plank-on-frame boats from kits, the first with my dad and the second on my own, after a crash course in plank bending from a neighbor who I wouldn’t be surprised to find on this forum. Last year my parents called me from a weekend getaway in a small town and said they had found the Rattlesnake kit, on sale, in a hobby store, and wanted to know if I would like it for my birthday. I thought it would be fun to get back into model ship building. At the time, my main hobby was an iPad app I was writing in my spare time, but that’s also partly my job, and it was a bit of a programming overload, and I wanted to do something in the real world for a change. I built my last models when I lived with my parents, so I had fun setting up a work bench in my apartment and getting new tools. I started with more or less nothing, and have bought tools only when I actually needed them. I didn’t know about the Model Ship World forums when I started my build. I wanted to document my progress, so I set up a tumblr account for this and other projects that I work on. I only found my way here when I started googling around with questions about this particular model, and discovered at least two other build logs for the same exact model. What an amazing resource! The first bunch of posts will be reposts of the same photos from tumblr, though I may embellish the text with technical details better suited for my fellow pintsize shipwrights. It seems customary to start with the box, so I will as well, along with a sneak peek of my current progress: I look forward to interacting with and learning from all of you as my build progresses. I welcome your feedback and questions, and I will have many questions of my own. U.S.R.C. Ranger 1852 by Small Stuff - Corel - SM 55 "1:64"
Dear friends, am I "on a completly wrong steamer"? My thread is a little bit surrealistic because the kit is standing before my feet. But I have stifle the wish to start to built imediatly, because of a row of unfinished work/unanswered questions.. So I have forced myself to put her in the signature as "shelfware" as we call it in the IT: U.S.C.G. "Ranger" 1852 Corel-Kit No. SM 55 1/64 vel 1/48 L.: mm - 465 W.: 390 mm - H.: 220 mm Name & Authencity questionable The last line is most important for me. These doubts come from these few lines: USRC Ranger (1852) Corel Only Ranger was an early 1800s unarmed LHS schooner Corel's model has the lines of an early 1800s cutter, but the name is wrong Available coming out of the following source: www.coastguardmodeling.com/10_Questionable-Authenticity.html I have consulted these article in here: modelshipworld.com/index.php?/topic/801-usrc-ranger-by-trippwj-corel-164-scale/ I bought the kit as an 1:50 one with the idea to change it "up" to 1/48 - but now I've to do a much longer step 1/64 to 1/48. I want to use the moulded GK boat kit as a ship's boat for the revenue cutter - so this tww discussions are interwoven to each other. So I think about two ways to scale the cutter: Wayne took the kit as a 1/64 and is going this path with good progress - I could follow his way. Life will be fine! So I'm unhappy because I'd like to go to the bigger scale. But I think I might built these cutter in 1/48 as a smaller one and have to change the ergonomic details as stairs, doors, hatches, stancions, &c. And so I have consulted my Chapelle books and have till now no conclusion if I may be right. So what du YOU think abeut my idea - am I "on a completly wrong steamer" (that's German idiom for thinking in(-to?) a outright wrong direction)? And I also think aboiut the two ways to build them: I prefere the Alert stile - as a realistic used ship - on the othrhand the lines may stand out better to a clear background. What is your answer to this question how to show the attractive lines of the hull.. (Oh - this may be a questions to the girls aboard.) I allready know it's just a wooden kit and definitly not an oviparus fleece-giving and UHT-milk-producing fattening-sow of European Conformity (see bootom picture.) But I'll try to get most of my money. So thanks for reading and your intrest. Well, after lurking here for just over a month, reading, studying and absorbing as much information, my first kit The US Brig Syren arrived from the US model expo after over a month delay. I must admit customer service from outside the US at Model Expo has been poor, and shipping was extremely slow and extortionate. Packaging was substandard, and I just hope nothing had been damaged in the crushed, non-padded box. 1st step is to clear some clutter from my work spaces. They are not really usable for anything at the moment. I've taken a few quick snaps of the box, the contents, and other items I've ordered. I will wait until I clear a nice spot, and distract the 3 yr old before opening the box, and getting the obligatory shots and item stocktake. This is where I do my office work, and occasional gaming. It needs a major sort My spare office is currently set up building a carbon fibre RC 6 turn brushless 1:10 buggy. I will maybe pack this away and use this zone. A very excited 3 yr old wanting to build a ship Substandard packing, with crushed box, tape not sealing all over and some random fish and chip paper. No bubble rap to cover to precious contents Out of focus picture showing the Syren box, a plank bender, some spare boxwood planks, a hull vice, micrometer, and draw plate. And here she is. The Syren in her box. I'll clear a work space, organise my tools, get some sandpaper, blocks, glue in the next few days. Unfortunately I'm Oncall for Obstetric emergencies tomorrow, and trauma Thursday, so I may be stuck at work for the next 48 hrs, but fingers crossed I get to open the box!